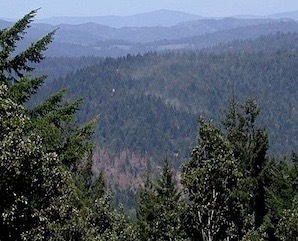 THPBlog: Mendocino Redwood Company planning another THP near Compatche, CA. Mendocino Redwood Company planning another THP near Compatche, CA. This THP is about 11 miles SW of Willits, CA and about 3 miles NE of Compatche, CA at an elevation of 200 to 1,200 feet. Mendocino Redwood Company is planning a tractor and cable logging operation on steep and unstable slopes in redwood and Douglas fir forests. The THP area drains into the Big River which is listed as impaired for sediment and temperature. There are 12 road failure sites including multiple fillslope and cut bank failures, and road bed re-construction planned across active and dormant earth flows. Mendocino Redwood Company wants to use tractors on steep slopes over 65% grade with a moderate erosion hazard, use tractors on steep slopes over 65% grade to end line logs, and construct seasonal roads on steep slopes over 65% grade. 71 road drainage sites are planned for work including rocking, dip construction, culvert repair/replacement and restoration of washed out crossings. Populations of Oregon gold thread were found along the banks of the North Fork of the Big River. For spotted owl nesting territory MD075 (2013): foraging habitat decreased by 4 acres within .7 mi; for spotted owl nesting territory MD239 (2014) foraging habitat decreased by 18 acres within .7 mi; and for spotted owl nesting territory MD438 (2014) foraging habitat decreased by 37 acres within .7 mi. This THP is just north of Mendocino Redwood Company’s 1-15-013 MEN (Jeep Trail) and 1-15-031 MEN (Mettick-Poverty) THPs. More information is available on the THP Tracking Center website.